There’s just something about a truck. Ever since their invention in the early 1920s, pickup trucks have remained an American staple, a symbolic nod to style and grit on both backroads and city streets. However, these days, truck sales are actually falling. Drive by any dealership’s lot and it’s likely that you’ll see lots of pickup trucks gathering dust instead of gathering dirt like they were born to. Because of this, truck dealers are trying to attract customers in any way they can. And if you’re in the market for a truck, this can (and should) work to your advantage. Why are so many dealerships slashing prices on trucks? These days, fewer and fewer people are buying trucks. Sales have fallen between 6% and 7% for major manufacturers like General Motors and Ford. This is primarily due to rising gas prices. However, manufacturers actually want you to be able to afford a truck. It benefits them and makes sure their business won’t become obsolete. Combined with the dealership war on pickup trucks, this results in better deals for you. What is the dealership war on trucks? 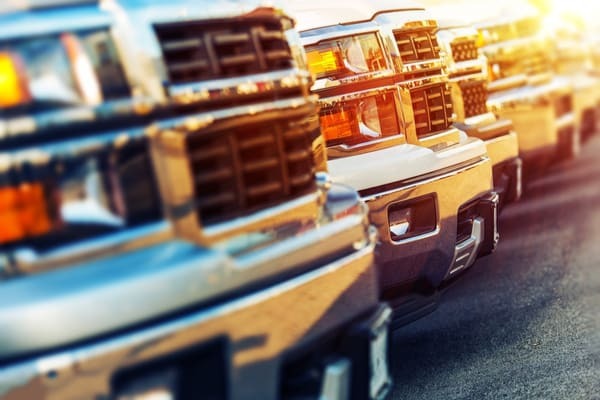 In short, every truck dealer is trying to sell more than the next one, and by competing with one another for the highest bottom line and the most sales, these dealerships have created huge discounts, more financing options and special sales strategically timed throughout the year. If you’re looking to buy a new truck, this is really great news for you. Which truck companies are cutting their prices dramatically? In light of the recent developments and low sales, most truck companies are offering some great deals. Here are some recent developments, by brand. Built Ford Tough — you’ve heard the saying before, and it’s their well-known tagline for a reason. Ford trucks are perhaps most well known for their strength and durability. And right now, you can get the popular aluminum-bodied 2018 Ford F-150 for a lower price than normal. Search for low-interest financing options and cash-back deals. The average person has been getting around $3,500 cash back, and some dealerships are even offering a whopping $4,250 cash back. Ram trucks are reliable and rugged, well-loved by celebrities and farmers alike. This is a great performance brand that is usually only offered at a premium price point. However, right now, Ram is offering 20% off older models at dealerships and online. And the cash-back deals aren’t too shabby, either — you can get anywhere between $2,500 cash back to as much as $7,000 cash back on certain Ram truck models, including the popular Ram 1500. If you’ve ever researched trucks, you know the name Chevy. Chevy trucks are extremely popular, and right now, they’re more affordable than ever. Chevy is offering some truly fantastic cash-back deals on new models. You can get anywhere between $1,000 and $3,5000 in cash back on new models, as well as incredibly deep price cuts if you choose to buy last year’s model. The best way to find what you’re looking for is to conduct a simple (but thorough!) search online.